After leaving college, black and white pen and ink drawings were the first media I was really attracted to. They require a patience and dedication which are akin to a mediatative state. 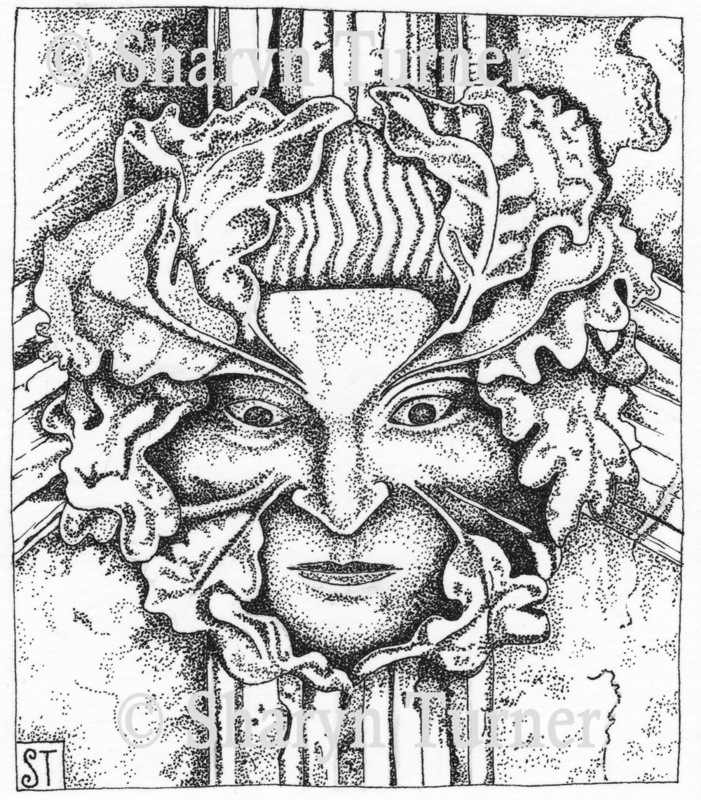 Many of these drawings show the iconic green man. He is a common sight in Medieval churches, peering down from high. An overtly pagan figure who refused to be driven out by the Christian religion. All of these greenman designs are available as both prints and greetings cards. Cards cost £2 each plus P&P. Prices of prints vary. Please contact me directly to buy. I can also hand tint the prints with watercolour. From St Andrew Church, Sampford Courtenay, Devon. It is thought to date from the 14th or 15th Century. This wooden roof boss shares the church roof with a striking carving of a God like bearded man above the alter as well as one of Devon's famous 'Hunt of Venus' carvings depicting three hares in a circle. From All Saints Church, Sharrington, Norfolk. It is one of the 19 carved wooden roof bosses. Thought to date from the 13th or 14th Century. I grew up in a village next to Isleham in Cambridgeshire so was quite excited when this little wooden carved greenman, known as The Peyton Green Man, was discovered in 2004. He was hidden up in the rafters of the Isleham Church, next to the Isleham Angel. 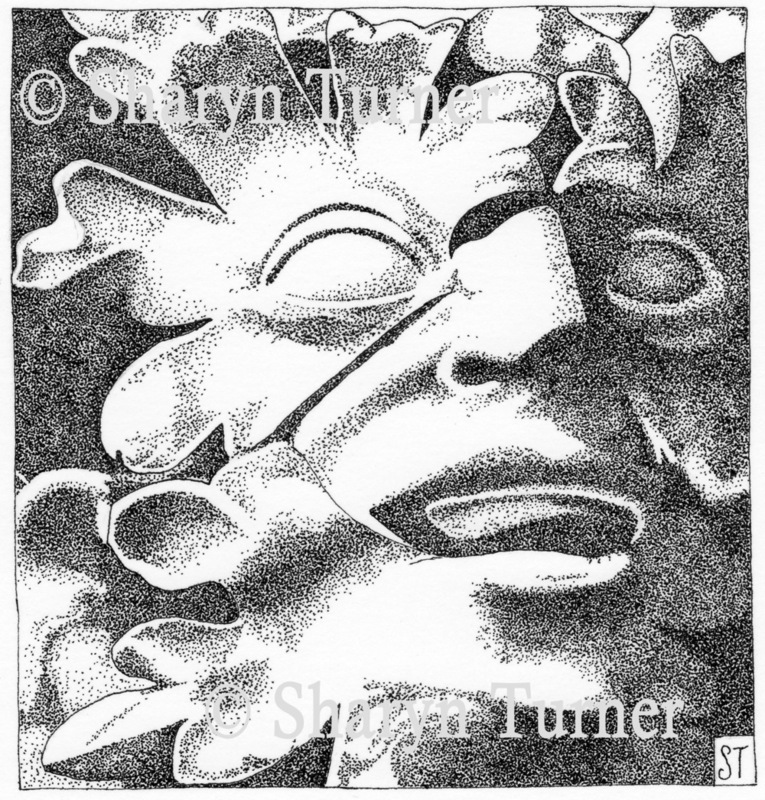 The Green man was discovered after the Isleham Angel tumbled from the rafters and had to be repaired and replaced. 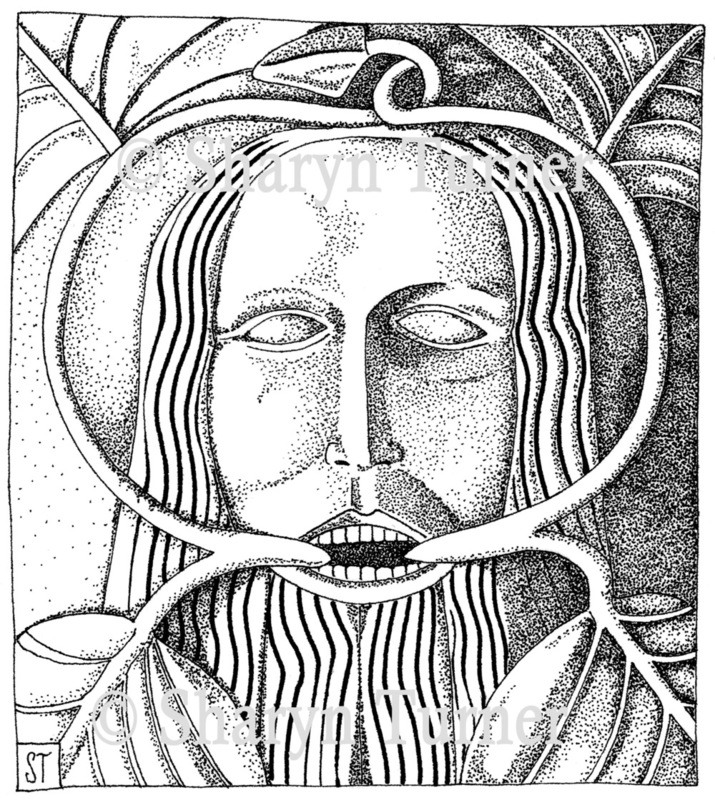 The Greenman was carved in 1495 for Crystofer Peyton, or at least for his project, to refurbish the Isleham Church and decorate it with angels and other symbols. From Lichfield Cathedral, Staffordshire and part of a foliate capital (column head). Carved sometime around 1340AD. This is the only face to be found amongst the cathedral's carved greenery and is thought to be of the master mason, Walter de Ramesey. From Norwich Cathedral, Norfolk. This is one of the many carved stone roof bosses to be found in the cathedral's cloisters. It is thought to date from the 14th or 15th Century. This hauntingly painted face is masked by gilded hawthorn leaves. The hawthorn is traditionally associated with the pre-Christian pagan rites of May Day. From All Saints Church, Silkstone, Yorkshire. Thought to date from the 15th Century. The best selling item my Etsy shop - I have made this illustration into a PDF format crow garland that you can make yourself.